Cake Wrecks: Do These Drumsticks Taste Funny to You? Steph A., I'm pretty sure that this is the stuff nightmares are made of. Tasty, tasty nightmares. - Related Wreckage: Why Are the Children Screaming? This has to be one of the worst ccc ideas yet! Please! How could you possibly serve someone a cupcake with a "leg" on it??? Not to Anyone over 2! Don't worry about the clowns, sweetie, they're quite 'armless. Ewwww, I hate clowns....and this just further exemplifies why!!!! BLECH! Perhaps it's lack of Sleep, but I think they're not nearly as Awful as some CCC's I've seen on here. Pull off the Clown pick heads, and you've got over iced Cupcakes, with Sprinkles! Why , what was once a Clown Leg is now simply a ..Oh, my. I actually have nothing constructive to say, but my WV amuses me. sydabl - the exact way you pronounce "syllable" when you have the plague of death, which I happen to currently possess. It's like Cirque di Clown. What is with all these pop ups about survey's? Never seen that here before. I'm not going to visit if I have to spend so much time clicking off survey pop ups. I'm not even scared of clowns but I think I might be NOW! They are all squatting, with sprinkles spewing forth from...well, you know. That's the first sign that you need help. The second is denial. What do you have to say, Mr. or Mrs. Wreckerator...? WV: alesters: I'll need a few of these before this monstrosity starts to make sense! Thanks for the turkey related wreck on our Thanksgiving -from your Canadian fans! "Don't worry about the clowns, sweetie, they're quite 'armless." Best comment of the day. flutter around the birthday boy. Their laughs drown his screams. The one on the right seems to have his eye on the one on the left... creepy stalker clown. Where are the arms? Or are those supposed to be the arms as those "feet" are just round blobs and as everyone knows clowns are actually Sasquatches who perm and dye their hair, shave and paint their faces, and wear comically large shoes to disguise their identities. I want to draw and quarter my clowns, I demand arms...errr, legs....whatever! Haha, Clowns on gyno chairs. Yep, that's exactly what I want for my Birthday... a cupcake with a limb from a clown on it. So I guess these clowns were drawn to be quartered? Oh, god... where are their hands? What are they doing with their... hands? AUGH, NO! NO! PUT OUT MY EYES! And the position they're in? 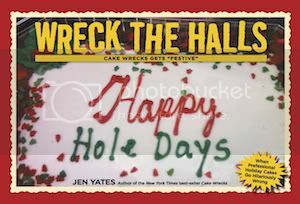 Nevermind the hideous Cupcake Clown disaster -- all of todays COMMENTS are absolutely HYSTERICAL!! I can't stop laughing!! You guys are too darn clever!!! "Clowns on gyno chairs" -- Bwwwwaaaaahhhhhhhahahahahaha!! I did the survey, pretending to be a 27 year old from Arkansas with a paid off mortgage, and it hasn't come back yet. I figured the richer and more target demographically American I was, the better for Jen. It's Thankgsgiving today here, so I though the drumsticks were going to be turkey. Taylor - it's worse than that! It's a CCCCCCC - A Colorful Creepy Circus Clown CupCake Cake. Either they are giving birth to some horrible confectionary abomination or just fiddling with themselves...can't quite decide which. "Why , what was once a Clown Leg is now simply a ..Oh, my." I like the one on top the best. Blue frosting and a clown. Yum-my! You know, originally these were the only clowns I didn't feel like I should run screaming from. The little faces are actually rather cute. Then I noticed that they look like little frogs. Clown frogs. With sprinkles. Is it my own sick mind, or does the white on the clowns' bodies look like pairs of billowing-sleeved arms clasping together "somewhere" between the clowns' legs? Don't tell me you don't see it. Exactly WHAT are the clowns doing with their hands in their laps..EEWW! 'Scuse my French, but poullet d'autre un. Get your Pap smears, ladies! It looks as if the clowns are giving birth....though I can promise you, birth does not include that much frosting. Aaaah! clowns are so scary! Yuck! Haha! I wated to stop by to let you know that I have an award for you! Just stop by the address below to get it! I've always hated clowns and now I have more reasons why. I love doing the WV - but not today for obvious censorable reasons. WV - suckh. Really. 'nuff said. What bothers me the most is that they are all spread-eagle. Eww. I actually took your Nielson survey because it said it would take 10 minutes and I wanted to be helpful...but it actually took a good 20, FYI. Nightmares of children made all of these. =D lolz. LOL clown cupcakes would be fine but these are down right creepy. and why does the one clown leg look broken? 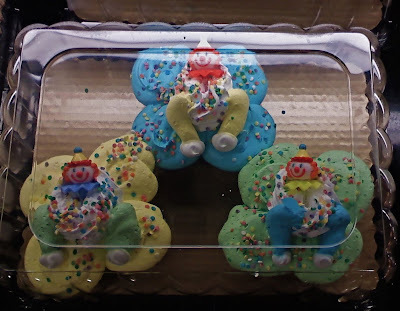 Armless icing clowns with "drumstick" legs giving birth to sprinkles on top of four-leaf cupcake clovers. At this point, I think even Salvador Dali is going, "Woah, guys, this is weird." So when I first saw this, I assumed the "ruffles" for their collars were actually their arms... in which case, they must be in line for the bathroom because they need to pee. Really, really badly. Oh look..they've got sprinkles on their junk! That makes it okay and fun doesn't it? Lets compile what we have so far shall we? Are those clowns mutants or aliens? Do none of you watch MST3K? Clearly, these little clowns with the drumstick legs are an homage to Torgo. Do not mock the Torgo cakes. The Master does not approve of such things! You are on the front page of the NYTimes.com right now! Right...um..well...those are very happy clowns. Yes. Obviously this CCC is in honor of the movie making the list. ... & with polka dots! As if clowns aren't scary enough already!! AAAAAAAGGGHHH!! !